Yesterday, I shared a photo of our eight Frans Fontaine European Hornbeam 2.5" caliper trees that had been delivered. These trees were a long-time coming and we've been planning, talking and thinking about them for almost a year. 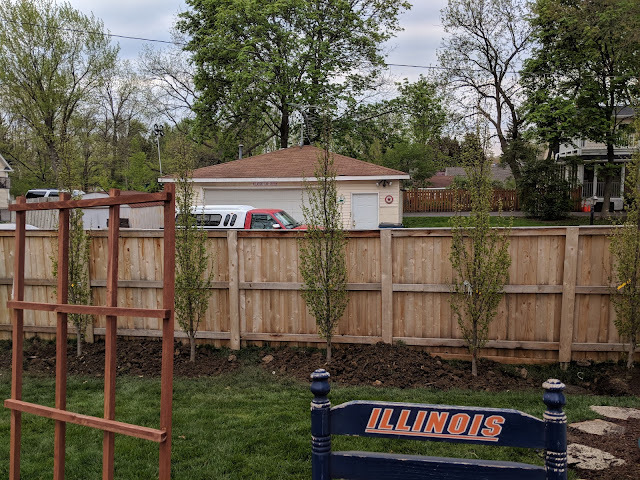 Today, the trees went in! Here's the guys digging the holes and placing the trees in the holes to check for placement and spacing. We ended up going with six feet of spread between each one and 30" away from the fence. You can tell from the photo above that they are going into a low spot and that our neighbor's to the north truck and garage are pretty visible (right now) from the top of our property. Here's three of the eight placed in their holes. 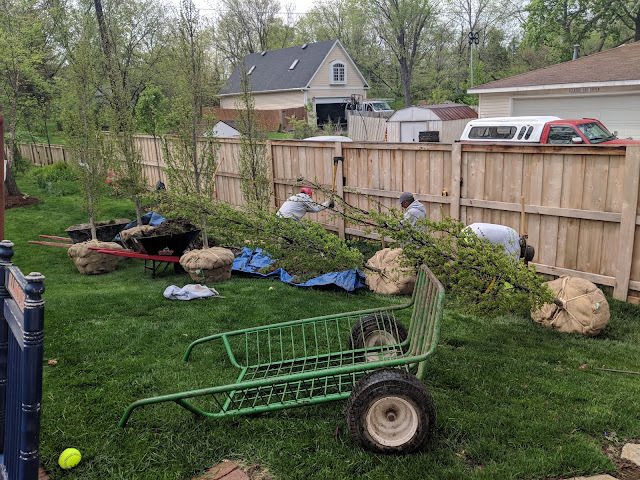 Once we were all happy with the placement, the burlap and rope were removed (well...the bottom of the burlap was left on because our landscaper prefers to keep the rootball intact, but the top of the burlap was cut off and all the rope was removed) and these trees were stuck back in the ground. This shot below gives you a sense for the spacing versus the fence and part of our house. It is a tight area, but one that really was screaming for screening plants. 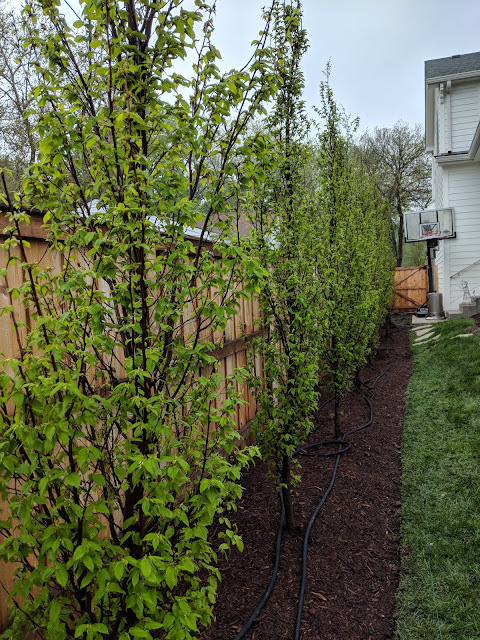 These Frans Fontaine Hornbeams were selected for exactly that reason - their habit will be a perfect fit. The trees are leafing out, but will still get more dense over the coming weeks, so while you can get a sense for some of the screening they're providing now, they'll be even thicker as the leaves get bigger. Here's an overview of five of the eight trees. This shows the spacing. Are they a hedge right now? Nope. That's obviously not ideal, but if we planted these any closer together they'd grow right into each other. This way, we're playing for the future and with careful feeding and watering, I'm hoping that these not only shoot up a bit in the coming few seasons, but also fill out from side-to-side so the gaps go from about four feet down to two feet or so. Then, with time, they'll fill in completely. This shot is the first one that shows the finished bed. After planting, the crew edged and mulched the bed. 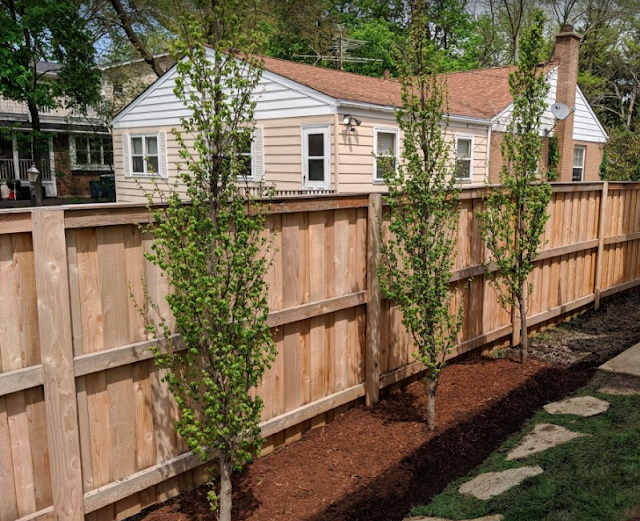 Looks really nice and per the landscape plan, I'll be planting some hostas in below these trees in the beds. 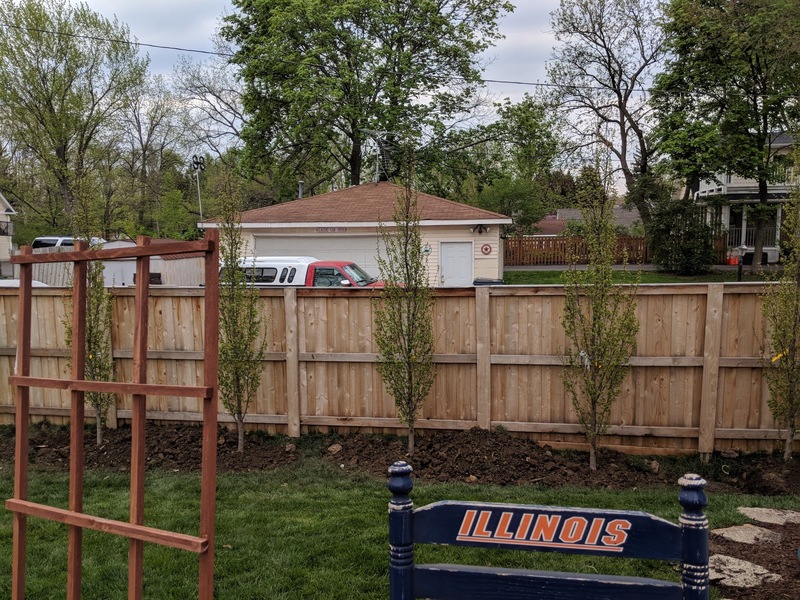 Here's another perspective on some of the trees and the newly created bed. 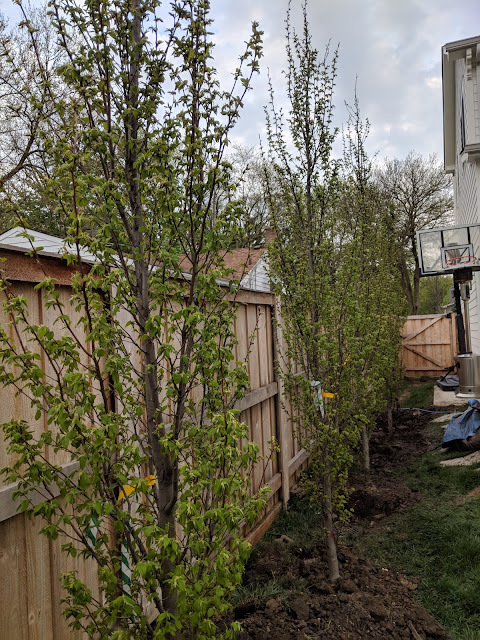 To the left of this photo, you'll see a small Cleveland Pear (flowering) tree followed by a spot of orange color - that's our new Azaela. They're both surrounded by grass right now, but the plan calls for this bed to extend all the way down there. 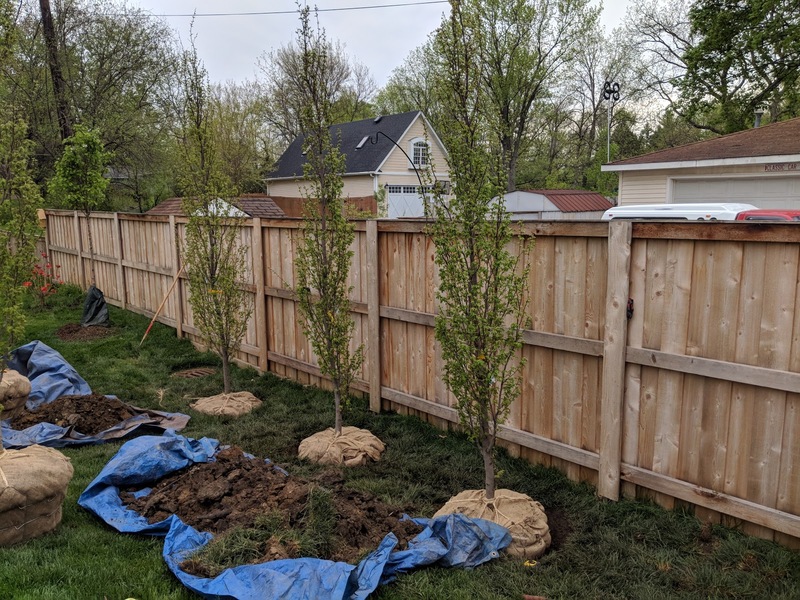 Here's the other three Frans Fontaine Hornbeams - these are the ones that will provide the screening for our screened porch. I'll baby them with water and food and *fingers crossed*, they'll flourish here and provide us with screening for years to come. I'm expecting to want to 'limb up' these trees, but for the first two growing seasons, I'm not going to touch them. 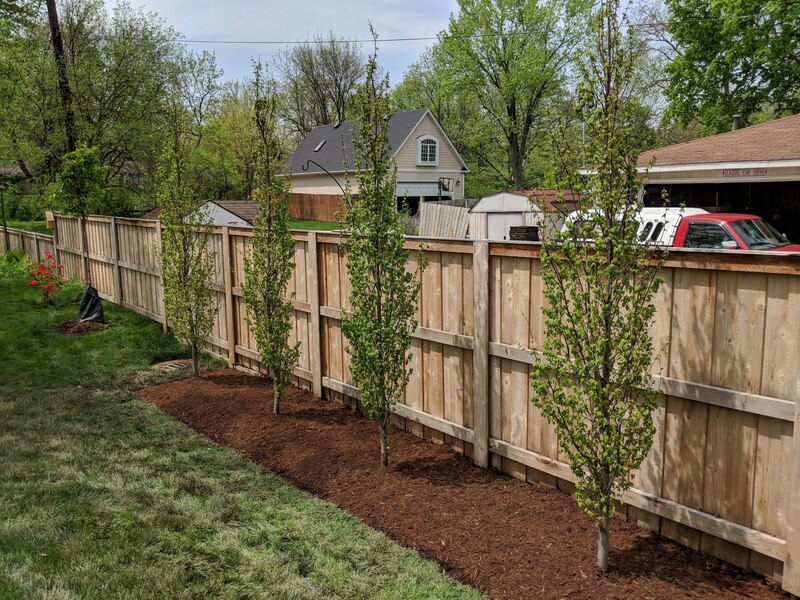 We could have planted Chanticleer flowering Pear trees or some other columnar tree, but we waited (and paid more!) for these and I'm really pleased with the decision. And, for those keeping track at home, these mark the 21st tree we've planted in our yard since we moved in. 21! Reforestation is what I'm now calling it and while it is going to take time and effort, if we stick to it, the longer we live here the more we'll have trees all around us. 2. Flowering Pear in front yard by garage.